Call it a tune-up weekend. Early spring racing largely had runners positioning themselves for greater efforts in the coming months, but California’s Nine Trails 35 Mile, three Backyard Ultras around the world, and next weekend’s Georgia Death Race give us plenty to talk about. Hello, Monday! Santa Barbara may be nicknamed the American Riviera, but the Nine Trails 35 Mile Endurance Run had none of that. The coastal out-and-back has some serious vert and the race collected 11,000 feet of elevation gain. Last week’s column incorrectly pointed to course records from 2017, but the race’s history actually dates way earlier. Taylor Nowlin and Sandi Nypaver ran to 6:24 and 6:30 first- and second-place finishes. For Nowlin, it was a successful turnaround from an eighth-place run at last month’s FOURmidable 50k, and she next heads to the Lake Sonoma 50 Mile. She finished second in a breakout race at Lake Sonoma last year. Nypaver’s calendar next includes the Broken Arrow Skyrace 52k in June. Jade De La Rosa was third in 6:58. All three of the podium men eclipsed the longtime 1994 5:35 course record. Jim Walmsley was off the front in 5:12, and was chased by Jared Hazen and Kris Brown. Hazen and Brown, the latter of whom won here in 2017, finished in 5:23 and 5:29, respectively. 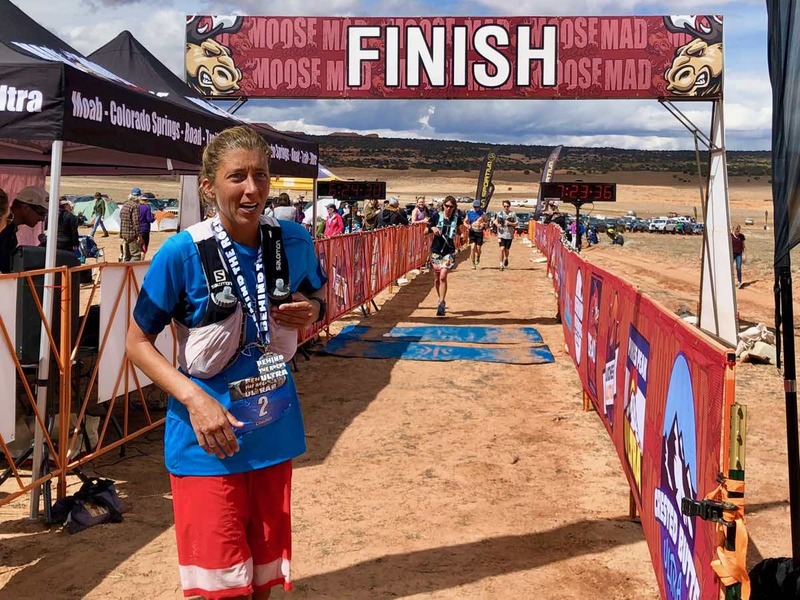 Four race distances, including two ultramarathons, made up the sixth-annual Mad Moose Behind the Rocks Ultra. Courtney Dauwalter was the overall 50-mile winner in 7:23. It was a new course record too, though barely two minutes better than Marianne Hogan’s 2017 run. Dauwalter won last year’s race in 7:51. Wendy Stalnaker and Amy Thorson were a distant second and third in 9:11 and 9:20, and Sarah Bunting Lamos won the accompanying 50k in 4:48. Erik Sandstrom got away from Joshua Lund and Nolan Brady to win the men’s 50-mile race in 8:07. Lund edged Brady for second, 8:24 to 8:27. Kyle Pietari, who won the 50-mile race last year, won the 50k race this year in 4:10. Pietari is a fixture at most Mad Moose races in the Moab area. Spring on the U.S. East Coast means the Terrapin Mountain 50k–for the 12th year in a row–and race #2 of the six-event Beast Series. Candace DeLong won the women’s race in 5:19. Anna Evans and Emily Warner were second and third in 5:26 and 5:38. It really must be spring, Nicholas DiPirro was shirtless when he finished first in 4:17. He was eight minutes better than his own winning time at last year’s race. Jim Sweeney and Frank Gonzalez ran 4:22 and 4:29 for second and third. 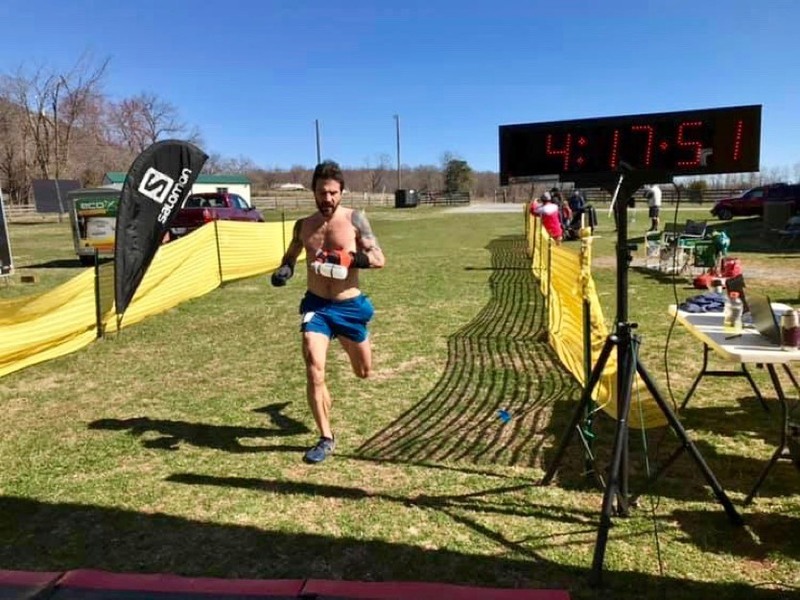 The notorious Big Backyard Ultra in Tennessee has spawned some friends, and a few of those sister races happened this weekend. The winners of each of the Ostmarka Backyard Ultra in Norway, the Great Dane Backyard Ultra in Denmark, and Ohio’s Backyard Ultra won automatic entry into the original Big Backyard Ultra later this year. In line with tradition, each of the races were to have been run on a 4.167-mile loop. Tobbe Gyllenbring won the Norway race, going for 33 laps. At least part of that race was held on snow. In Denmark, Leon Hansen mercied the field after 27 laps. 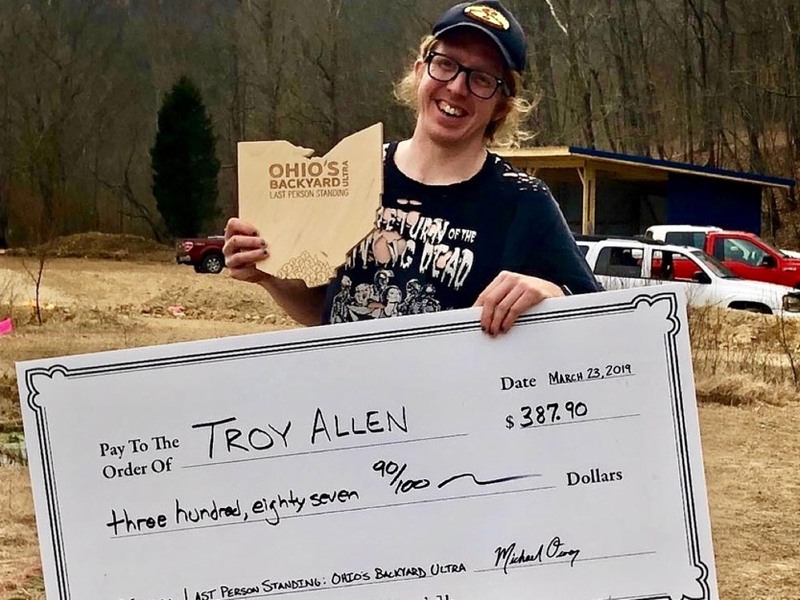 And then in Ohio, Troy Allen went for 31 laps and 130 miles to win the inaugural event. Temperatures dropped to 25 degrees Fahrenheit overnight. Full results (when available). On New Zealand’s South Island, Tania Miller and Chris Bisley won the Northburn 100 Mile in a respective just over 28 hours and just under 24 hours, according to social media. Can anyone who was on site share a few more details on how the race went? Full results (when available). There were three ultras at the Antelope Island Buffalo Run, held on an island in Utah’s Great Salt Lake. The race’s 14th running had 100-mile, 50-mile, and 50k race distances. Andrea Feucht and Michael McKnight won the 100-mile race in 21:32 and 17:46. Caroline Wallace and Jeff Friedman topped the 50 mile in 8:14 and 6:59–five seconds under 7:00!–and Deanna Halford and Jeff Browning won the 50k in 5:01 and 4:00. Full results. It’s a weekend late per the calendar, but the St. Patrick’s-themed Get Lucky 50/50 happened for the first time in northeast Ohio. The 50-mile race had 18 finishers, and surprisingly all were men. Brian Polen won by over an hour in 5:57. Pamela Mcgowan and Josh Sanders won the 50k in 4:37 and 4:05. Full results. The San Jose Trail Run 50k in California crowned Gabrielle Maudiere and Ryan Montgomery as its champs in 5:28 and 4:22, respectively. Full results. In Illinois at the Clinton Lake 30 Mile race, Elizabeth Riffel-Altman finished just over five hours and Mark Holcomb finished just under four hours. Riffel-Altman won the women’s race in 5:02, and Holcomb won the men’s race in 3:59. He beat the four-hour buzzer by nine seconds. Full results. New Jersey’s Mt. Tammany 10! race has 10 climbs, totaling over 10,000 feet of elevation gain, and a 10-hour cutoff on trails around the Delaware Water Gap. The race gets to about 40 miles. Mendy Gallo and Jay Lemos won in 9:18 and 7:38. Full results. The New South Trail Marathon in North Carolina is a fundraiser for… the U.S. National Whitewater Center. The fourth-year race, a two-lap marathon, had Holly Burwinkle and Joe Day as its winners in 4:30 and 3:40. Full results. The Georgia Death Race 72 miler is the third of five Golden Ticket races, and the only one east of the Mississippi River. The top-two men and women each will earn automatic entry to the Western States 100. 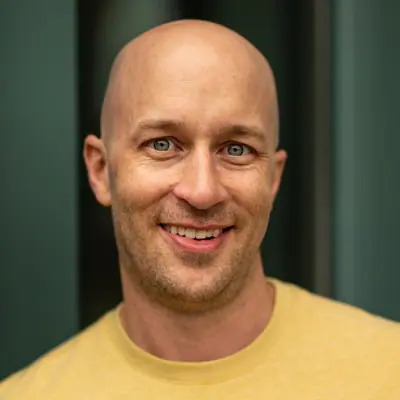 Kim Magnus (Canada) – 2nd 2019 Chuckanut 50k 3/25 Edit – Magnus will not start. Molly Schmelzle – 1st 2018 Pine to Palm 100 Mile 3/25 Edit – Schmelzle will not start. Parity, it’s going to be close. Buehler has the field’s best credentials, but does that matter on rugged East Coast trails? Andrew Miller won here in 2018, 2016, and 2015, and he is the course-record holder. If Miller is healthy and on the start line, he’s the heavy favorite. He won last year’s race by almost an hour and could do that again. Help us add to this week’s column below. Leave a comment to share results from a race we didn’t cover, or to add extra, on-site insight to a race we did. Thanks! How do you see the Georgia Death Race playing out for the women and men? 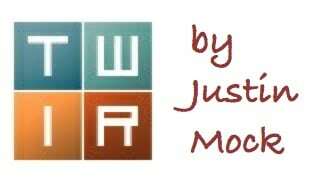 Hey Justin, great column, as usual. I am heading down to GDR this weekend and I understand from the RD that on the women’s side Magnus and Schmelzle will not start. Editing, thanks for the tip! This weekend is the 2nd edition of the world famous Boulder Seltzer Mile. We have stacked fields on both sides featuring some of the Boulder areas finest trail joggers. On the women’s side expect road marathon super star Deanna Ardrey to either do really well of DNF due to lack of seltzer experience. Kristin Mohror and Flannery Davis are both looking to complete the epic Behind the Rocks/Seltzer Mile double after winning the 30k and 10 mile races over the weekend. RJ Boyle will be looking to improve upon last years performance. Jayme Bergeron and Jaime Pfahl will both be attending but have yet to record race legal chugs. The men’s side is also very competitive featuring many of last years top performers. Brandon Yonke will look to improve upon his runner up finish from last year. Newcomer Brooks Mitchell has clocked a 10 second chug and has a mile PR of 5:30 so look for him near the top of the list. Joey Cavarretta has the fastest recorded chug of the season and has been scrambling in the flatirons every few weeks. RD Jeremy Hendricks has been running up Flagstaff road every so often and will be a contender for the crown. Anyone interested in running this free event should contact Eric LiPuma. Another woman to watch at GDR is Meg Landymore, who was the overall winner and course record holder at the 2018 Georgia Jewel. Also look out for Shannon Howell at GDR – 1st place and new course record holder at the Grindstone 100 in 2018. Luis did a great job up in Santa Barbara this weekend, so good to see everyone out there! I was over at Northburn for a cheeky 50km and it was a cracker. Kiwis are pretty understated bunch, but there was a bunch of good running going on. The crew that run these races are renowned for their community feel and grass roots style. The 100km was taken out by Steve Pemberton in 14:11:34, and Veronika Palockova in 16:21:28. Nancy Jiang is having a blinder of a season adding the 50km to her tally of race wins this summer with a 5:47:27 in the 50km. Young buck Brooks Macdonald over from the US on a semester of studying in Dunedin came out to play and took the 50km in 5:34:47. There was some damn fine burgers at prize giving and some excellent local brew on tap too! Oh and it was really quite hot on Saturday, this may have been the reason the attrition rate was 30 folks out of 81+ starters! Or it could be that the course is just really hard!? !